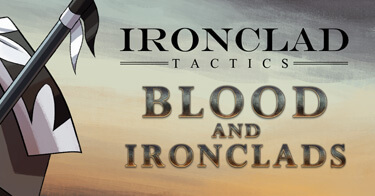 Ironclad Tactics is a fast-paced, card-based tactics game set in an alternate history Civil War – with steam-powered military robots! Experience unique gameplay, blending the precision of tactics and card games with the spontaneity of a fast-paced strategy game. Follow the campaign story through a fully-illustrated interactive graphic novel. Collect cards as you play through the campaign and build your own decks to crush your foes. Play with your friends in the co-op story campaign or against them in skirmish and nemesis modes. Face off against online challengers in quick-skirmish mode and unlock special cards when you win. The steam-powered automatons of the American Civil War make their way to Europe in Ironclad Tactics: Blood and Ironclads, the newest free update for the fast-paced, card-based tactics game Ironclad Tactics. With eight new missions, two new full-sized armies, and a challenging WAR! mode, you’ll unlock up to twenty four new cards from the French and German Empires! 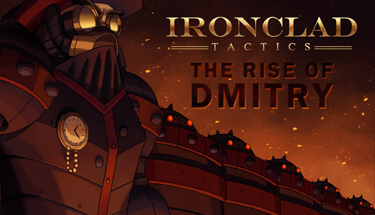 Explore the untold backstory of Dmitry in Ironclad Tactics’ first free update, Ironclad Tactics: The Rise of Dmitry. With eight new missions, including the six-stage “Fort Phantom Ridge” gauntlet mission, you’ll unlock up to eighteen new cards, including Dmitry’s fearsome army of transforming ironclads.